Momentarily when I arrived home, I was happy to see the internet had been fixed…then I sat down and it stopped again. Perhaps its some radio wave I emit when I enter the house!? Its working right now at least, so I will get on with todays post. 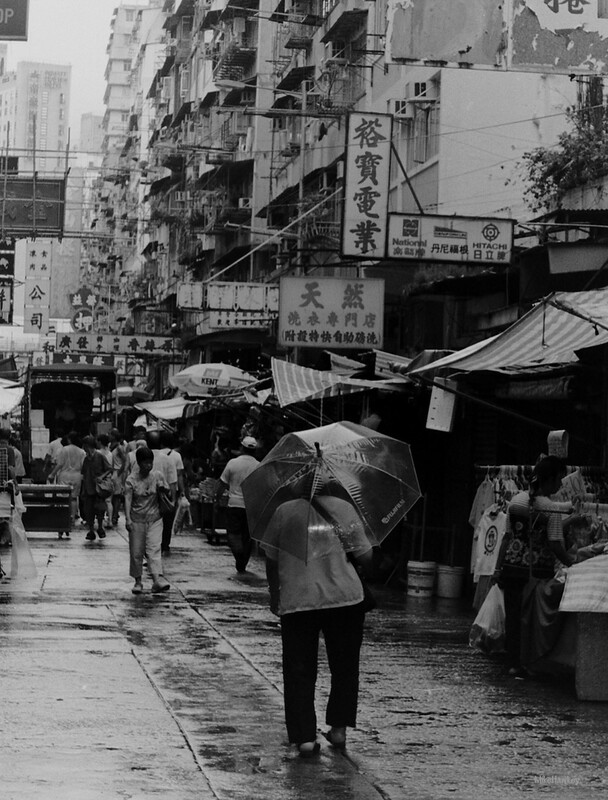 Shot back something like a decade now in Hong Kong on my Minolta Dynax, I captured this image from one of the local market streets. It had been raining, and I vaguely recall walking up behing the old lady with the brolly to frame her in the shot looking up the street. Originally shot in colour film, after it being scanned in, I converted to B&W in gimp, and slightly cropped the aspect of the image. I’d love to get the opportunity to stop over at Hong Kong again. Its a world apart from here in New Zealand, and perhaps its that difference that makes it so appealing. I love the contrast of buildings and people around. Following various bloggers and youtube channels, I like to see what is changing and what is the same. One day I’ll head back.